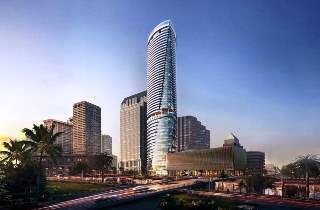 TAMPA — A lawsuit over the mix of residences and offices in the planned $350 million Riverwalk Place tower has been dropped. Last August, Riverwalk Tower Investment-Intown LLC, which had been expected to be one of the developers in the project, filed suit in Pinellas-Pasco Circuit Court against Feldman Equities LLC and two other companies involved in the project. Intown contended that it was to handle residential development within the tower, while Feldman Equities handled the office development. Instead, according to the suit, Feldman Equities president and chief executive Larry Feldman tried to push Intown executive Greg Minder out of the project. On May 11, Intown dismissed its claim. Terms of the settlement were not disclosed. Contacted Friday, Minder declined to comment. "The parties have amicably settled this matter and have withdrawn all legal claims related to this case," Feldman said in a statement. "Riverwalk Place is a transformative project that will change the skyline of Tampa and dramatically enhance the downtown area for everyone. We look forward to its success." Riverwalk Place is proposed for the former site of the failed Trump Tower project of the 2000s. It would have more than 50 stories of offices, restaurants and stores, plus, on its highest floors, about 240 high-rise condominiums. Last month, when Feldman and his new partners from Two Roads Development in South Florida unveiled a sleek design for the tower, which is planned on the site of the failed Trump Tower project of a decade ago, a reporter asked whether the Intown lawsuit could have any impact on their ability to move forward. "In big commercial developments, there’s always a likelihood that there’s going to be some litigation," he said then. "As you can imagine, the Two Roads folks are committing millions of dollars of their own money. GBP Capital (Holdings LLC of New York) is committing millions of their money. I’m committing my money. We would not be doing this lightly if we thought that this litigation were in any way a threat to the project. There is no stopping power from that litigation. The project’s going ahead, full steam."